The following was found in the library of the TzHaar. It was the only Jal'yt - human - book that hadn't burned to ash, so it was likely preserved by its original owner, to keep it legible. The writer is thought to be a famed chronicler of life under Zaros as one of his generals, but this is the only volume of his work to be found. It was written in the Second Age, when the Mahjarrat followed Zaros. With a sigh, I moved Zamorak's staff from my book. Mahjarrat have never respected anyone's space or magical artefacts. "The dancer's the last of her race, if Zaros is to be believed. You'd like her story full of brigands, massacre and tragedy," said Zamorak, gesturing towards the stage. A dancer, brown-skinned and with hair that undulated like a blanket of fire, cartwheeled. Zamorak took a sip from his red wine, two beady eyes staring at me. I broke his gaze but instead found myself scanning the rough skin-folds of his forehead, his prize from a successful rejuvenation. I felt sick thinking about the skeleton I had grown accustomed to, hiding underneath that skin. "You want something from me, Zamorak?" My voice wavered. Writing about Mahjarrat comes vastly easier than talking to them. Zamorak grinned, the flesh stretching and pulling across bone. He turned his attentions to the dancer as the motions of her poi formed illusory wings across her back. The army infantry, in chairs about the stage, clapped and cheered as her performance neared its climax Zebub's annihilation of Onkhara. "You're direct in speech but not in writing, Perjour." I sighed, pinched the bridge of my nose, and leaned forward in my chair to close the book I had placed on the table. Gods and Mahjarrat they leave little time for art. Zamorak spoke again. "Zaros has given us a job. Tomorrow, at first light me, you, Thammaron, Viggora and Enakhra." "The temple-builder?" I asked. "Interesting, Anything I need to bring?" "You'll need the book, of course. Zaros wants everything recorded, as he does." The dancer, performing as the winged demon Zebub, took a torch from a pedestal and lifted it to pursed lips. A wave of fire warmed the faces of those in the front seats. "Can I help with anything else, Zamorak?" "Zaros needs us to take one of his prized possessions with us." His fingers, unblemished and marble-white, scratched absently at his face. 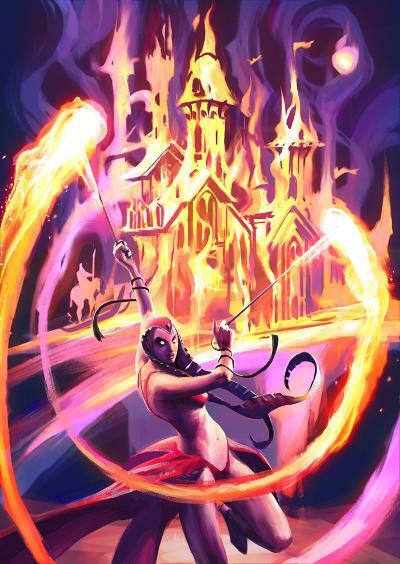 The dancer, as Zebub, blanketed the stage with fire, completing the annihilation of Onkhara, lost city of the North. "Zaros wants us to take the dancer." I'm not sure I fully understand." The dancer handled the reins of the horse awkwardly as she talked. Rather than being afraid or inexperienced on the horse, she seemed uncomfortable with the contact it made with her flesh. I slowed to a canter. "It's like this when I experience something, it is written in the book. I can't change it, erase it or hide anything from it, and Zaros claims the book from me after every mission. He likes to read about everything that we have done in his name." "No, I don't understand why. Has he made you this way to ensure that everyone stays in line, that no-one betrays him?" I tried not to inwardly agree with her, but it was too late I could sense the words already scrawling on the page. "It's a record of his acts. A great leader must have his biographer." She nodded. "He is certainly a great man. A great god." Her attentions drifted, and the light shining on her arms seemed to flicker. I couldn't help but recall the rumours that she was Zaros's concubine. "And you? How did you get your fire powers?" I asked, hoping to move the conversation away from me. I thought of Zamorak and how it was always one of his favourite tricks, to direct me towards libellous thoughts, to cause my emotions to betray my mind. No doubt Zamorak was surprised that I still lived. "Power? My people were all born like this. It is - was - nothing to us; just the fire that cooked our meals, that heated us in the cold. But the barbarians that massacred my people thought we had great artefacts." Zamorak rode to us, his black eyes glinting with the dusk light. "We've arrived. Thammaron has spotted an encampment over the ridge." We knelt in a small circle, hoods over our heads and voices hushed. Zamorak, Thammaron, Enakhra, Viggora. The dancer remained tending to the horses. "They are nothing, perhaps eighty strong," Thammaron growled. With his horns retracted, his face became grotesque and gargoyle-like. "We could storm the village, take them in seconds." "What we've come for is hidden. We can't risk damaging it - whatever it is," Zamorak answered. "Then why have me here? And I thought we would be free to discuss...things." Zamorak looked from face to face, and rested on mine. "Thammaron, you are right," he said. "We need to discuss our plan without Zaros's eyes on us". Enakhra tutted. "Even saying something like that in front of Perjour, Zamorak - it'll raise Zaros's suspicions. He'll read it in the book. He always does." Zamorak nodded. Then he removed the bag from his back. Opening the clasp, he lifted out a book that looked something like my own and began reading from it. "With a sigh, I moved Zamorak's staff from my book. Mahjarrat have never respected anyone's space or magical artefacts." What was this mischief? That was me, my thoughts! "What are you doing Zamorak?" In a panic, I opened my own bag and pulled out my book. Yes, I still had it - scuffed and stained from years in my hands. I opened it. My thoughts were there - but how had he gained a copy? "Read the last few paragraphs, Perjour", Zamorak said, smiling. I scanned them. They talked of our group, stopping before the ridge, spying on the people there and noting that they were devoted to Guthix. Then it talked about us gathering in a circle, discussing how we would approach the village, and then we knelt to pledge allegiance to Zaros. "What is this, Zamorak? These are lies!" Zamorak grinned and those pearlescent fingers drummed on the staff. "Remember the first line I read, the first line of your book, Perjour? I moved Zamorak's staff from my book? A spell passed to you in that moment, as we watched the dancer. In my hands now, I have a book that will note your every thought, as your book always has in the past. In your hands, you have a book that is written by someone who did not have a voice until now. Let's call it your fear." Was now the best time to run? I saw Zamorak's eyes darting to the book in his hands, reading my thoughts. "There will be no running, Perjour. Fool as you are, you fear nothing more than the wrath of Zaros. You fear that he'll read some sentiment that he disagrees with, that he'll come across a seed of betrayal. Your fear, if it had a voice, would write a book that is exactly as Zaros wants it to be. Well, with my staff, I give your fear that gift." I looked down to the book in my hands. It wrote about the five of us, gathered in a circle, organising a plan that would best suit the wishes of Zaros. "One book for me. The truth. One book for Zaros. The lies. So, now, we are all free to talk. Does it not feel refreshing?" Their moment was broken by a scream and the whinnying of horses. They took her? From us? You got to admire the audacity," Viggora said. He idly looked through the contents of the dancer's bag, discarded by the savages who had absconded towards their village with her. "We kill them now, Zamorak?" said Thammaron. "Zaros's eyes are clouded. You said so." "No", said Zamorak. "Zaros felt there was something useful to him here. We find it, then we decide if it should benefit us or Zaros." "And how do you suppose we do that?" said Viggora. "We change the author of this book. Let's read what the dancer has to say." With a touch of his staff, the book's ink changed from black to a liquid gold. The gag tasted of fish, likely ripped from a knapsack. My hands were put in gloves that felt slick and wet, my head put in a sack, and I was thrown over the shoulder of the biggest of them. I could feel his cold sweat on my wrists and shins, and everything span back to that moment five years ago. I couldn't stop from hyperventilating, as the screams of my family echoed from those dull, repressed corners of my mind. Collect yourself, Char. I called the fire into my fingertips. Yet, although I could feel the fire in my veins, something halted it. What had these savages done? The bag came off my head and I was thrown to a wet flagstone. Pain shot through my thighs, as the shale drew blood that mixed into saltwater. I was in the shallows, dotted with hexagonal flagstones, and the dusk light danced on the waves. Behind me was the rough chatter of savages on the beach. "Chain her, and keep hands off her. I will gather the warriors." A brute shoved my hands into a rough iron shackle that was bolted to the flagstone. I moved to touch his arm as he knelt down beside me. No sparks came. Was it the gloves holding me back? I took in my surroundings. Flagstones dotted the swash in both directions with isolated figures on them, never closer than fifty metres from each other. I strained to see them in the failing light of dusk. The closest of them was old, some seventy to eighty years. She moved her hands about in the water, looking for something. With a sudden movement that belied her age, she jerked a rock out and held it aloft. Angular legs skitted out of the rock, and scraped at the woman's wrist. Have I been brought here to fish? The old woman looked about. Bringing the rock crab to her chest, she mumbled something and then fire - fire! - crept from the tips of her fingers to cook the crab. Auspah! The people here are my people, my Auspah! Chained to rocks, cooking fish! Barbs of a whip flew towards the old woman, as a savage spotted her. "Not now, firemaker! You cook for Fremennik." The old woman held the cooked rock crab up on a welted hand and the savage took it from her. A voice whispered into my ear from behind. "We knew what you were from the start, heretic. You have same hair as the old ones." I moved my head back, hoping to catch the savage on the nose. She was too fast. "You see, we know how weak your kind is. All sparks and smoke. When we burned the bodies of your race, they made more fire than any of you could call upon." Fury and fire, fire and fury. "You will learn to keep us fed. You will warm us and light our defences, and your friends will not save you. We have sent many warriors to your camp, warriors that have never been bested." A boot slammed into my back and I was thrown into the water, only to be jerked back to the flagstone by the shackle. "Now move your hands towards me, so I can cut holes in the tips of your gloves. You will feed us with cooked fish, or you will feel the barbs of my whip." I felt fire swell in my fingertips, burning with an intensity that I had never experienced before. Fury is in fire, fire is in fury. "They are coming, Thammaron", said Zamorak, throwing down the book. Viggora twisted two hands about his axe and Enakhra gripped her staff. Thammaron grew to full size and let his horns curve from his forehead. They formed a circle, facing outwards, and, as is customary, I climbed a tree to let them fight. But a fight did not come. Instead, shacks near the shoreline, down in the village, erupted in a tower of flame. I craned to look from my position on the elbow of a branch. "What is happening, Perjour?" said Zamorak, his palm upward with a small storm brewing upon it. "I'm sure you'll read about it," I called out. I looked over to the village again. From the sea came a bright light, not moving fast like a fireball, but slowly, ambling an indistinct and bright form. An icyene? It grew in size, and I could see its form. Great horns twisted from its brow like creepers. Arms, thick with bright muscle, grew out from a broad chest. Its two legs were thick and dazzling, stomping out of the swash and onto the land. Then there was the face, contorted in agony - rage? - but was one that I knew. Not an icyene. It was the face of the dancer, and her eyes burned with the blaze of a furnace. What has happened to you? There were no illusions here; no flicks from her poi or blasts from her torch. She was one with the fire, a walking inferno, and she was laying waste to everything about her. Smoke like great mushrooms billowed into the growing night, spilling spores of ash. The barbarians scattered, but most fell and burned on the beach like pyres. Once, she had performed as Zebub; now, it seemed like she was Zebub, razing the village as the great demon had once razed a civilisation. Zamorak looked up from below me, the book wide in his hands. A grin failed to hide the supernatural glow of a skull beneath it. He shouted up. "Perjour! We've found what Zaros brought us here for!" Thammaron, Enakhra, Viggora, all dropped their weapons, sat on the ridge and laughed, taking in the display. Below them, the dancer roared and the village burned. Not a word of it was written in the book meant for Zaros.